Whitby is a charming town that rests along the North Yorkshire coast at the mouth of the River Esk in the United Kingdom. Whitby visitors will find that Whitby possesses uniquely diverse claims to fame. The well-known explorer Captain James Cook began his famous sailing adventures here. Legendary writer Bram Stoker experienced a stroke of genius in Whitby when he first conceived the idea for his classic novel Dracula. The town also has continued fame for its reputation as one of the UK’s primary fishing ports. A permanent settlement was first recorded in 656 when the Christian king of Northumbria dedicated his first abbey, Hilda in what was known as Streonshal. In 664 the Synod of Whitby was held there. Later in 867 the monastery was destroyed by Vikings. It was later re-established in 1078. During this time it gained the name “Whitby”, old Norse for “white settlement”. From then on, the town functioned primarily as a fishing settlement until the 18th century it developed into a port for whaling and ship building. A local trade also developed for locally mined alum and Whitby Jet Jewellery. Learn more about the Whitby History. Included in Whitby’s historical features is St. Hilda’s Abbey. Overlooking the town, settled on the East Cliff, the abbey was originally founded during the seventh century. It was attacked several times but different regimes until it was finally abandoned and left to ruins. Located in the same part of town are one hundred and ninety-nine steps carved into the side of the cliff. The steps lead to the old church yard that originally spawned the idea for Bram Stoker’s Dracula. Literary buffs will be tickled to discover Whitby’s rich literary tradition. In fact, the earliest English literature has been said to come from Whitby. Caedmon, the first recorded Anglo-Saxon poet served as a monk at Whitby Abbey during the St. Hilda abbacy. Bram Stoker’s Dracula, partially set in Whitby incorporated bits and pieces of the town’s folklore. Stoker even discovered the name Dracula at the public library. The novel Sylvia’s Lovers by Elizabeth Gaskell was set partially in Whitby after a visit from the author. Lewis Carroll’s first publications were in the Whitby Gazette written during his stay in 1854. Even Charles Dickens was known to frequently visit Whitby. Learn more about Whitby’s connections to Dracula. Much of Whitby’s acclaim stems from its status as a principal seaport. A Whalebone Arch, statues of William Scoresby and Captain James Cook all point to the town’s rich sea heritage. A popular attraction viewable today is a replica of Captain James Cook’s ship, Endeavor, built to scale. It is even possible to experience a ride in the famous ship throughout the year if the weather permits. Boat lovers will also enjoy walking along the wide spread Harbor, gaining general information about the Whitby culture taking note of the different types of water craft. Along the beautiful Harbor of Whitby, general information can be found on popular tourist attractions such as chartered fishing trips and pleasure cruises. Depending when the fishing fleet arrives, a fish market is held on variable days of the week at the Whitby Harbor. An auction is held to distribute the catch. Surfing, sailing and windsurfing are popular sports off the beaches between Sandsend and Whitby. Whitby today is a popular tourist destination which is popular with families and romantic couples alike. There are plently of things to do in Whitby during your visit. Whitby is lovely seaside community rich in history and set against a stunning backdrop. Love Whitby? Pin this page! 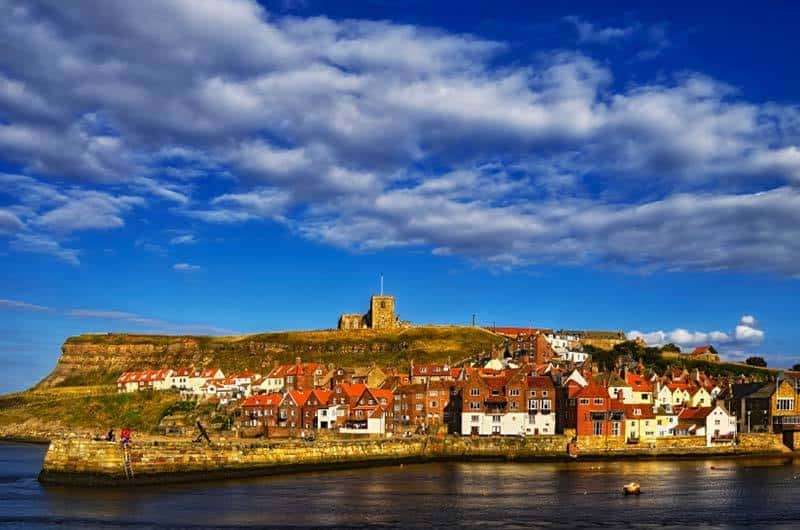 Read all about this historic sea port town on our fantastic guide to Whitby, the North York Moors, Yorkshire Coast and North Yorkshire. The Whitby Guide has all the local information to help you to plan, research and book your stay in Whitby.